There are 10 posts in this thread, and it has been viewed 16653 times. Game of the Week time! I've never played this game, so I don't much to say... Let's see what you guys have to say! 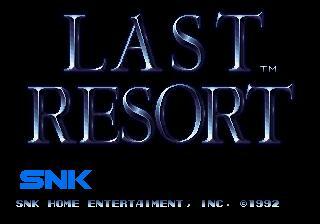 Last Resort is an arcade shoot 'em up video game by SNK released in 1992.The game uses only two buttons. 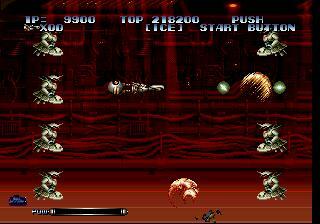 The player maneuvers the cyber jet with the joystick. If the player has the drone it will rotate in the same direction of the cyber jet. Press the A button to fire bullets. If you have the drone it will fire in the direction it is pointing. Provided you have the drone, hold the A button to power up the gauge amd let go to launch the drone in the direction it is pointing. The higher the power in the gauge the bigger the damage the drone can cause. Press the B button to toggle the stoptrack position of the drone, so it will stay on that point by the cyber jet, but the cannon on the drone can still rotate. Oh! Never tried this one. This is very classy shooter which I know is held in very high regard. I have this on NGCD and I am ashamed to say I have not put a lot of time into it as I have only got to level 2 or 3. Like Pulsar it is a hard nut but I do think I have it on my MVS multicart so I intend to tone the difficulty down low in the dipswitches and have another crack as I suspect some of the later levels will also look great. Being a shooter fan I really should have dedicated time to this and I will very soon as its to classy to ignore. Just the game I've been waiting for. 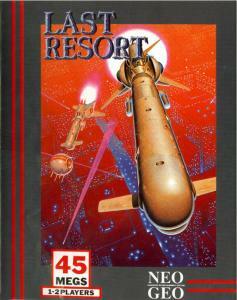 This game is excessively futuristic and its gameplay is pretty unique even though in Pulstar and Blazing Star, Dino 426 had the same drone defensive strategy. How far in the future do you estimate the game would take place? My guess is the 32nd century. 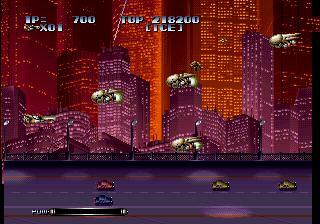 The bosses are very tough challenging opponents as they are. The first boss looks just like a damaged sentinel from X-men. The only thing I do not understand is what the difference between red and blue weapon pickups are. I think blue weapon pickups are ion-based and red weapon pickups are fire-based. It is too bad SNK doesn't make scrolling shooters like these anymore. I don't know if Last Hope is a sequel to this game, but Last Hope has a likeness to Andros Dunos as opposed to this game. and I thoroughly enjoyed playing through it 12+months ago... not long after I joined up! 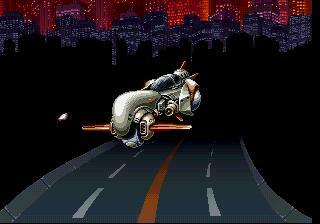 PPL were seemingly quite shocked that I finished this game, but to me, the game seemed fair... unlike the likes of R-Type for example - memory/trial and error based. I prefer shmups that rely solely on reaction and skill. This game fits the bill perfectly! This is an excellent shooter with an appealing visual style. That first stage in particular has a very impressive look to it. I've got this for Neo CD but haven't really put a lot of time into the game yet. A very challenging game from what I remember. It's a nice feature that this game has a simultaneous 2 player option. lol Merlin i keep thinking u are Boogiepop - at a glance your avatars look similar. Will - I think it is about 32nd Century too - you know your futuristic onions i think they will be called monioms and be part cyborg then tho. Never played it.... expensive cart for the AES, though, not sure if it is worth the price. voted "Its great! A definite classic!" This game is sort of a R-type'ish clone, but has it's own style in some way.. it stands the test of time pretty fine, but could have bin better if there where different ships to choose from with alternative shooting mechanics, never the less it's one of the better shmups on the neo I'll say.. I'm a real fan of 2D shooters and Last Resort is up there with my favorites. Great graphics, challenging game play, great bosses, it's got it all!